Display your favorite pieces on this stainless steel jewelry tree made from a single strand of wire. Necklace and Ring longed for wide open spaces. Rescuing them and their companions from the traditional box is Devin Mack's stainless steel jewelry tree. Made freehand from a single strand of wire and attached to a solid aluminum base, the piece is equal parts striking form and thoughtful function. Made in Baltimore, Maryland. Devin is a wire sculptor from Baltimore, MD. His love for wire as a medium grew unexpectedly from an early passion for drawing. After 15 years of experience with wire his techniques can be described as a mixture of both drawing and sculpture with a dash of balloon artistry. Dust occasionally and clean with gentle soap and water. I love it and it is exactly as described online. It looks great on the top of my dresser and feels like a centerpiece. If there was a taller one, I'd get that too and start my own little forest. It is listed as a jewelry tree, but I placed it out with some other display pieces because I thought it was beautiful on its own, without any added decoration. Purchased as a gift to be given in Dec. Arrived quickly. 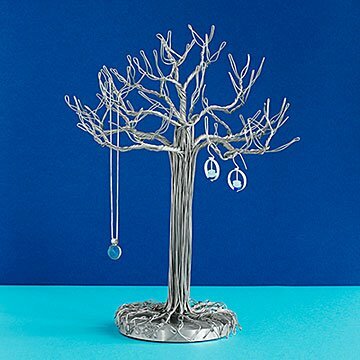 This jewelry tree is gorgeous and functional! I have lots of "Harry Mason" twist-through earrings and now I can finally display them AND easily grab 'em when I want to wear them! Beautiful product, was loved by recipient!